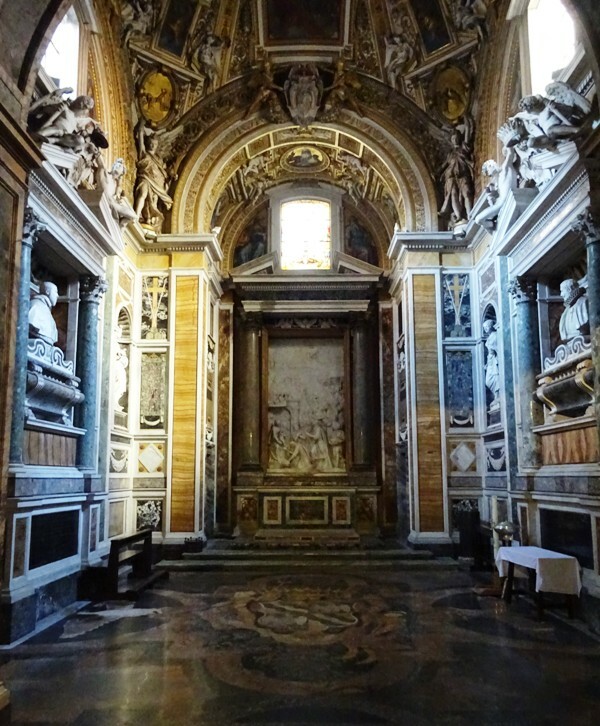 The Santa Pudenziana, near the much more famous Santa Maria Maggiore, is one of Rome’s best kept secrets. It is a hidden gem. 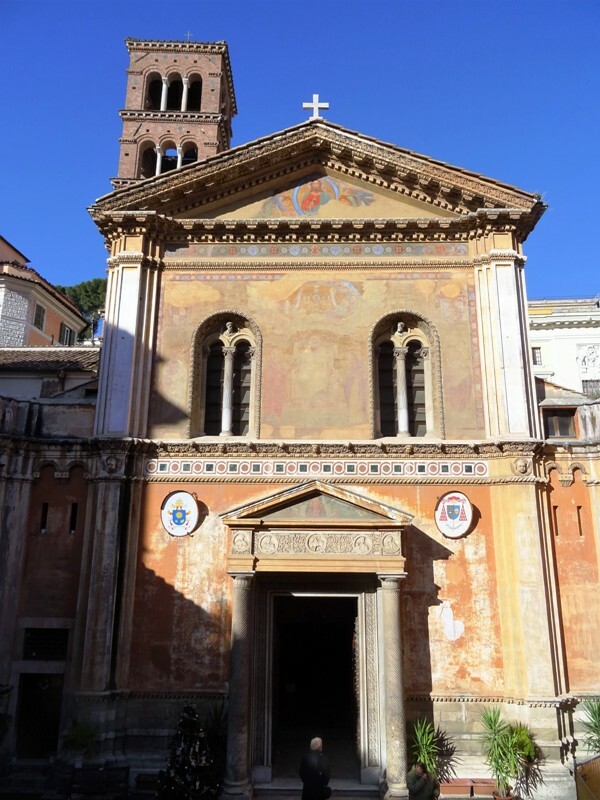 The church is one of the oldest in Rome and has an important and impressive late fourth or early fifth century apse mosaic. Yet the Santa Pudenziana is usually ignored by tourists, which makes it an ideal location for art lovers and history enthusiasts. The church is dedicated to Santa Pudenziana, Pudentiana in Latin. That Pudentiana managed to get a church dedicated to her is quite an achievement, since she probably never existed. Paul’s second letter to Timothy mentions a Roman Christian named Pudens, who greets Timothy (2 Timothy 4:21). A later tradition states that this Pudens was from a senatorial family and gave shelter to Saint Peter when the latter was in Rome. He is said to have had two sons and two daughters. The daughters were called Pudentiana and Praxedis. They took care of the victims of anti-Christian persecutions and Praxedis is said to have collected the remains of some 2.000 martyrs before the sisters were themselves martyred. It is highly doubtful whether the sisters ever existed at all. “Pudentiana” is merely an adjective meaning “belonging to Pudens”. It is quite likely that a domus Pudentiana or an ecclesia Pudentiana – house or church of Pudens – was mistaken for a place of worship dedicated to a female saint. While a Pudens may have existed and may or may not have been the Pudens from the Bible, the sisters in all likelihood are fictional. They have been struck from the General Roman Calendar and are no longer recognised as martyrs. The Santa Pudenziana seen from above (photo: copyright Google). In the first century, there was private house at this site, possibly owned by Pudens. Tradition holds that a church or chapel was built in the garden of the house during the reign of Pope Pius I (140-155), although evidence is scarce to non-existent. The house itself was converted into a public bath house in the second century and became known as the Thermae Novae. The fact that legend attributes the construction of this bath house to Pudens’ sons is clear evidence that the stories about Pudentiana and Praxedis make no sense. Pudens offered hospitality to Saint Peter, who was martyred during Nero’s reign (54-68), yet the construction of the bath house reportedly took place in 139. That means Pudens’ sons must have at least been in their seventies, but probably much older. It has recently been suggested that the bath house was, in fact, not a bath house at all but may have been a workplace of some sort, perhaps a tannery (cf. 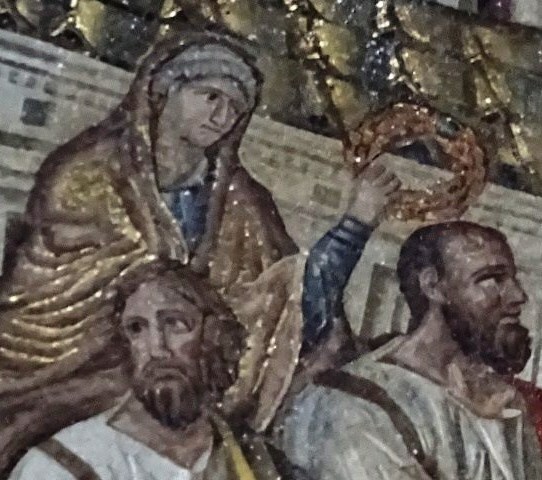 Santa Cecilia in Trastevere). During the conversion of the bath house, the apse and apse mosaic were added. The campanile was added in the Middle Ages. Several restorations took place during later centuries, until in 1588 a large reconstruction was ordered by Cardinal Enrico Caetani (1550-1599). The project was executed by the architect Francesco Capriani da Volterra (1535-1594), who is not to be confused with the fourteenth century painter and sculptor of (almost) the same name. 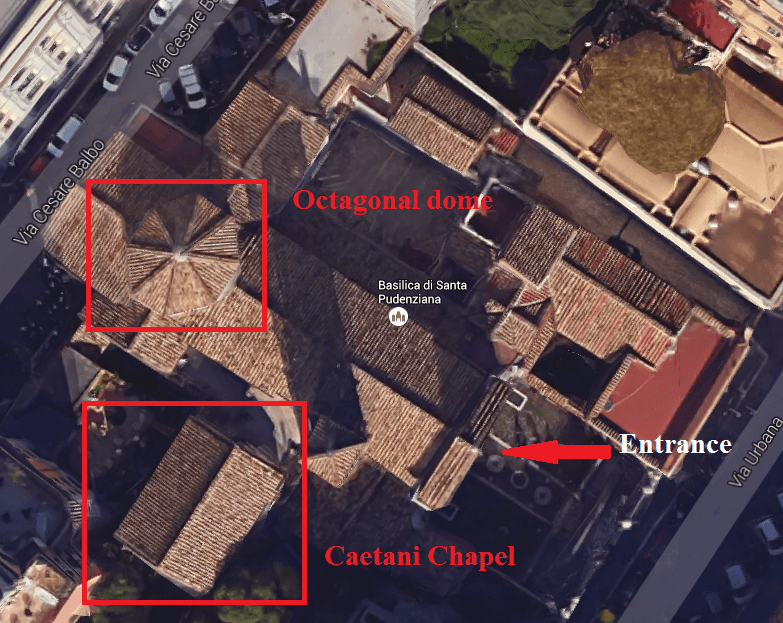 Capriani’s most important addition was the octagonal dome. Its elliptic shape can be best seen if you use Google Earth (see above). Unfortunately, Capriani’s restoration also destroyed parts of the ancient apse mosaic and demolished the chapel to Saint Pastor, where the entrance to the bath house used to be. This was done to make room for the present Caetani Chapel. This large rectangular building can be seen protruding from the left side of the main church. Cardinal Lucien Bonaparte (1828-1895), who was then titular priest of the church, ordered another major restoration in 1870. Lucien was a great-nephew of Napoleon Bonaparte, as his paternal grandfather, also named Lucien, was Napoleon’s brother. The future French emperor Louis-Napoléon Bonaparte (Napoleon III) was his godfather. An important part of the Bonaparte restoration involved the church’s facade. During the Caetani restoration of the sixteenth century, Niccolò Circignani – Il Pomarancio – had added a series of frescoes to the facade. These had probably faded and were “redone” by Pietro Gagliardi during the nineteenth century restoration. 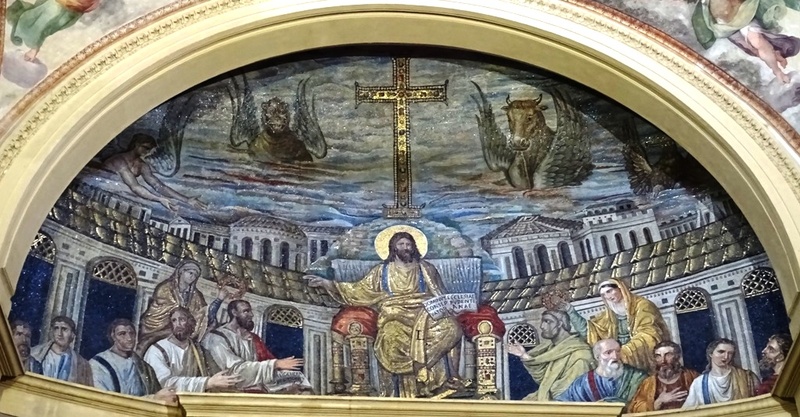 Unfortunately, Gagliardi’s work was of poor quality and only faded shadows of his frescoes remain today. In the centre, between the two windows, we see Saint Peter flanked by Pudens and Pudenziana. Bonaparte’s archaeological work on the site was of greater importance than his artistic achievements. 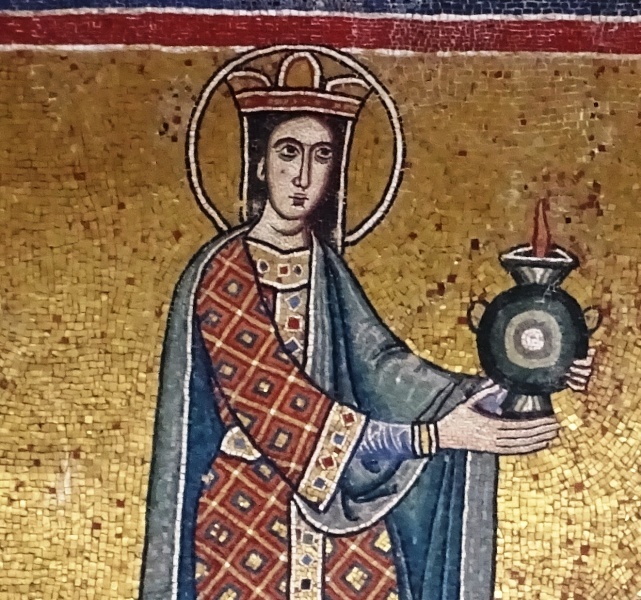 A virgin holding an oil lamp, Santa Maria in Trastevere. The fictional Santa Pudenziana holding an oil lamp. 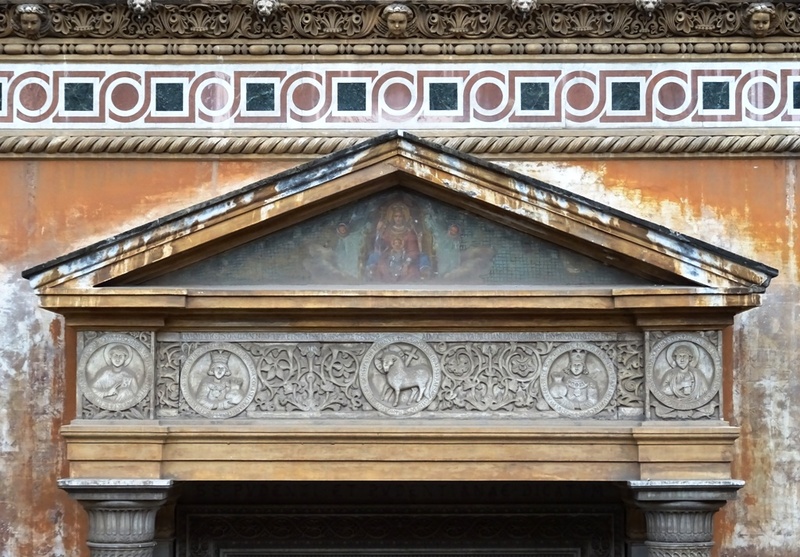 Fortunately, the nineteenth century restoration kept the spectacular medieval frieze above the main entrance intact. There has been some speculation about its age. It is usually dated to the eleventh century, but earlier – eighth century – and later – fourteenth century – dates are also given. It is probably safest to take the middle road. Please ignore the exceptionally ugly nineteenth century fresco in the tympanum above the frieze and take a few minutes to admire the frieze itself. In the five tondi are depicted (from left to right) Saint Pastor, Saint Pudentiana, the Lamb of God, Saint Praxedis and Saint Pudens. The inscriptions in the tondi of Pudentiana and Praxedis refer to full lamps (LA(M)PADE PLENA) and bright light (LVMINE CLARO) and it is probably oil lamps that both women are carrying, especially given the presence of what appear to be wicks. These lamps look quite similar to those depicted on the facade of the Santa Maria in Trastevere. A lit and burning lamp was seen as a symbol of a girl’s virginity. The nave of the church is unspectacular, and that is putting it mildly. The ceiling is completely undecorated and so are the brick walls above the arches to the sides. 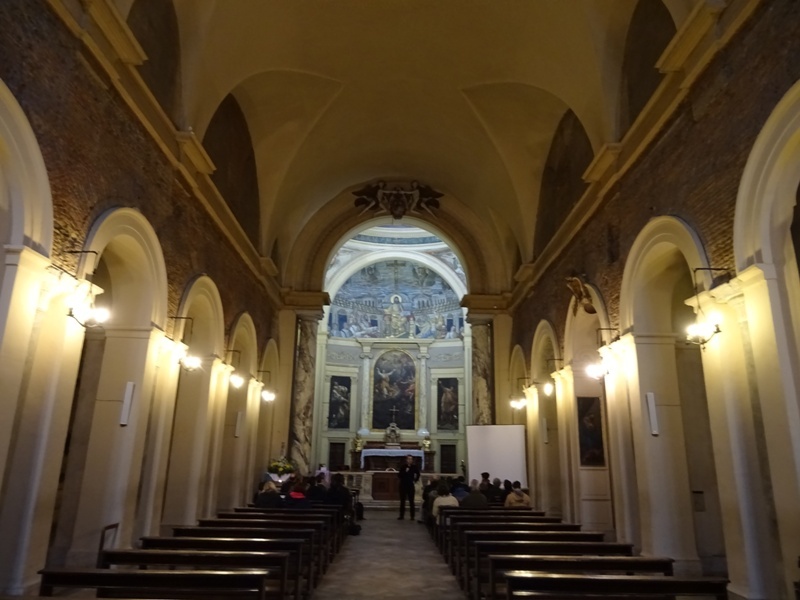 The sanctuary is decorated with some rather unimpressive early nineteenth century paintings showing The Apotheosis of St Pudenziana in the centre and panels depicting her fictional brothers on either side. Of course we have come here to admire the apse mosaic. It was probably executed during Pope Siricius’ pontificate (384-399), so it may very well be late fourth century. 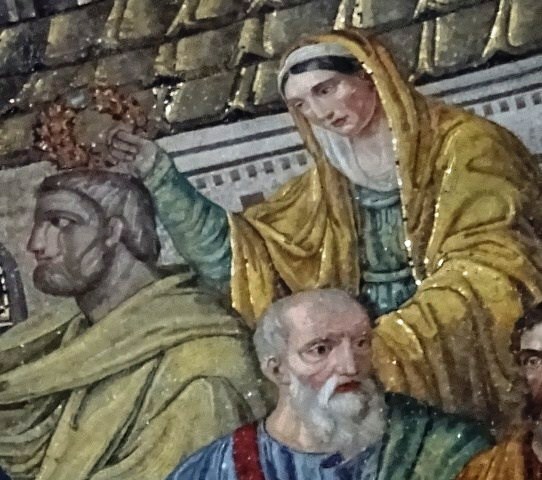 The church’s own website suggests a date between 410 and 417 and attributes the mosaic to Pope Innocentius I. Innocentius – Innocent in English – was pope from 401 to 417 and was a witness to the notorious Sack of Rome by Alaric’s Goths in 410. The church’s website calls this event “una sorta di “11 settembre” dell’Impero Romano”, which may be a slight exaggeration as Rome’s importance had been in decline for over a century and the capital had already been moved to Milan and then Ravenna. On the other hand, the Sack of Rome did inspire Augustinus of Hippo – Saint Augustine – to write his De Civitate Dei and both followers of the traditional Roman religion and Christians tried to make use of the Sack for their own causes. The church’s website claims that while other churches in Rome were vandalised during the Sack of Rome, the Santa Pudenziana was spared. 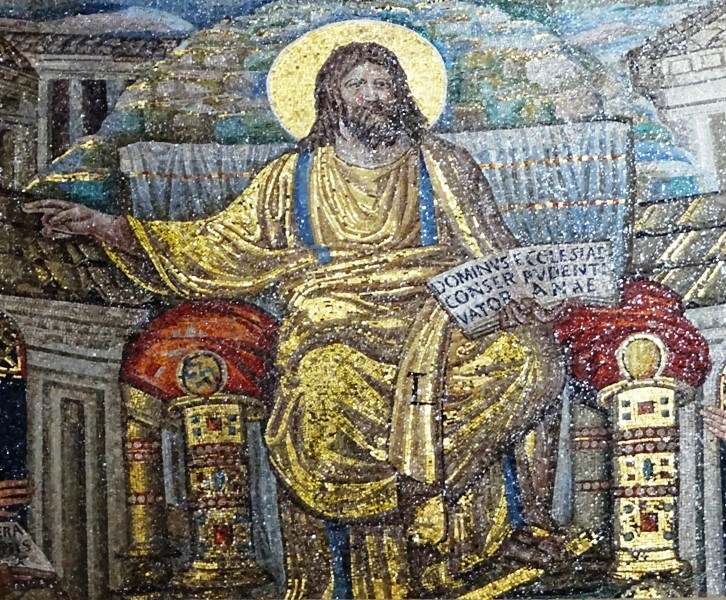 The fact that the church had not been damaged was – according to this website – the reason to commission the mosaic, which shows Christ in the centre, holding a book with a text that implies that the Lord has saved the church of Pudens. Is this argument convincing? Not really. First of all, the website does not cite the text of the mosaic correctly. The text does not read “Dominus Servator Ecclesiae Pudentianae”, but “Dominus Conservator Ecclesiae Pudentianae”. Both words simply mean “keeper” or “protector” and do not necessarily imply that The Lord had already saved the church once before. Perhaps it is safer to assume that the creators of the mosaic implored The Lord to protect the church of Pudens, something he may actually have done during the Sack by Alaric. After all, although that sack sent a shockwave through the Ancient World, the Goths were largely interested in loot and prisoners and did not burn down whole sections of the city. There was certainly damage and buildings like the Basilica Aemilia and the Basilica Julia on the Forum were destroyed by fire. But the damage to the city as a whole was not so severe and there is no real evidence that Christian churches were destroyed. After all, although an Arian and thus considered a heretic, Alaric was himself a devout Christian. The mosaic is quite different from the mosaics in churches like the Santa Maria in Domnica, the Santa Prassede and the Santa Cecilia in Trastevere. This is a pre-Byzantine style mosaic. There is perspective and the people in the scene look much more realistic. The late 4th or early 5th century apse mosaic. Christ is at the centre of the mosaic. He is wearing a golden toga with a blue strip and is the only person in the scene with a halo. He has a book in his left hand with the aforementioned text “Dominus Conservator Ecclesiae Pudentianae”. Christ is sitting on a golden throne. He is flanked by five apostles on either side of him, making ten apostles in total. This number is wrong of course, but the sixteenth century Caetani restoration destroyed two apostles completely and robbed the others of parts of their lower bodies. The apostles are dressed as Roman senators, wearing togas. The mosaic certainly had an epigraph once, but this was also lost in the “restoration”. Behind the apostles are two women. Note the differences in colour between the two: the one on the left looks kind of faded, while the one on the right has a soft pink complexion. Her robes are more colourful as well. This is probably the result of one of the restorations and has no specific meaning. Of course, that does not answer the question who these two women are. They were traditionally interpreted as Saint Pudentiana and her sister Praxedis, but even the church’s own website now rejects that interpretation. Since the women are (or seem to be) crowning the apostles Paulus (Paul) and Petrus (Peter) with wreaths, it is quite possible that they represent the Jewish and non-Jewish elements of Christianity (cf. 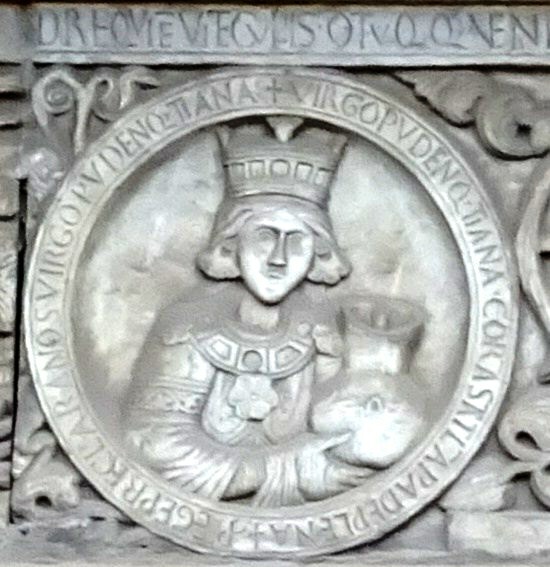 Rome: Santa Sabina). Paul represents the Gentile element, for in Romans 11:13 he writes “For I speak to you Gentiles, inasmuch as I am the apostle of the Gentiles”, while Peter is the apostle of the Jews. Behind Christ is a large jewelled cross on a hill, presumably Golgotha. The city in the background is most likely Jerusalem, either the real or the Heavenly Jerusalem. The makers of the mosaic clearly drew their inspiration from the Book of Revelation, as the figures representing the four Evangelists can be seen in the sky, a man for Matthew, a lion for Mark, a bull for Luke and an eagle for John. These apocalyptic elements seem to favour the interpretation of a Heavenly Jerusalem, but we cannot be certain and the fact that the epigraph has been chiselled away does not help. The book in Saint Paul’s hands. A final note of interest: Paul is holding a book in his left hand. On the pages one can clearly read the words “liber generationis”. These are actually the opening words of the Gospel according to Matthew in the Latin Vulgate: “liber generationis Iesu Christi filii David filii Abraham”, meaning “The book of the generation of Jesus Christ, the son of David, the son of Abraham” (Matthew 1:1). Saint Jerome (Hieronymus) may very well have completed his Latin translation of the four Gospels before the death of his patron, Pope Damasus, in 384. It is possible that the makers of the mosaic used the Vulgate Gospel of Matthew for this text, but we should remember that other Latin versions had been in use for at least a century – the so-called Vetus Latina – and Jerome was anyway ordered to exercise restraint while revising these older texts. 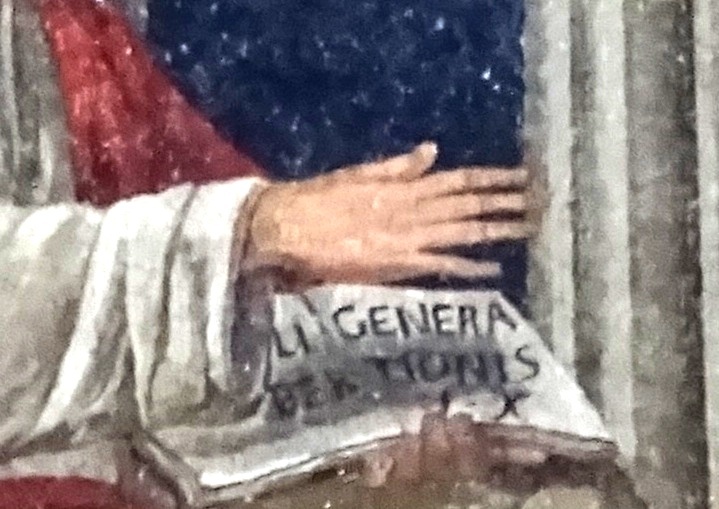 At the bottom of the book that Paul is holding may be two Greek letters, a capital iota and a capital chi, the first letters of the name Jesus Christ, Ἰησοῦς Χριστός in Greek. I might be wrong of course, it could very well be a case of pareidolia. I will bring my binoculars next time. Santa Pudenziana on Churches of Rome Wiki.